A circular walk from the picturesque village of Clapham, which affords wonderful views of Ingleborough and Pen-y-ghent. It heads past Ingleborough Cave, which can be visited and then on through the impressive Trow Gill to reach Gaping Gill. Here a shaft disappears 110m in to the ground, to reach a chamber which is the largest in the UK. Twice a year, pothole clubs raise funds by charging to winch people down the hole. Parking: The walk starts from large National Park pay and display car park (grid reference SD 745 691). Turn right out of the National Park car park. Follow the road round in front of the church and over the bridge. Turn right at the T-junction and follow the road up the hill following the sign for Ingleborough Cave as the road bends around to the left. For a slight variation to the walk, the first signpost (a white and brown one signed "cave, lake, woods and trail") that you reach after about another twenty yards can be followed to Ingleborough Cave. This follows the Ingleborough Estate Nature Trail through woodland and a small fee is charged. If this route is chosen, follow the very well marked route up to Ingleborough Cave and rejoin the walk at this point. Continue along the road for about forty yards, past the nature trail turn and take a right up the track signed "Ingleborough / Gaping Gill and Ingleborough Cave". At the start of the track there is a white sign stating "No road", but this is the public footpath. The track starts to climb slowly up the hill becoming a tarmac road after about two hundred yards, and is flanked for most of the time by walls on both sides. As the lane begins to level, limestone outcrops can be seen over on the right-hand side. There is an excellent panoramic view of the surrounding area from a wooden gate just before the track returns to gravel and stones. Progressing further up the lane, climb over the four steps to the left of a gate across the lane and continue onwards heading for another gate and climb the stile to the right of this one. The lane now affords excellent views to the right, where the limestone outcrops and pavements synonymous with this area can be seen. Behind in the distance can be seen the very distinctive nose of Pendle Hill (famous for its witches) which is over in Lancashire. In the trees below to the right is the nature trail path described earlier in this walk. Also over to the right, the lane along which the walk returns can be seen running parallel to the skyline. Continue on straight-ahead to the farmhouse, entering the farmyard through the first gate, then twenty yards further go over the stile to the right-hand side of the second gate. Over this stile turn almost immediately right at the sign for "Ingleborough Cave" and start descending down the grassy hillside following a well-trodden footpath. Continue on this until the path is met from the right by the gravel track emerging from the exit of the nature trail. Turn left onto this track and follow the path up to the stone house by the bridge at the entrance to the caves. A diversion can be taken here if you wish to take a tour around the caves. The tours leave hourly finishing at five o'clock at night in the summer. There is a small admission charge which includes a fifty minute guided tour. Crossing the bridge, climb the wooden stile a further twenty yards up the lane and then continue onwards on the gravel track. The track starts to bend and climb up the hill. Go over the stile to the right of the next gate and again continue onwards up into the steep sided limestone gorge of Trow Gill. Follow the path through the gorge and exit at the top where the gap is only a few feet wide. The path towards the top of the gorge becomes a little tricky in places with large boulders under feet to be negotiated. On exiting the gorge follow the well-trodden footpath which follows the right-hand side of a wall until a double stile is reached on the left-hand side. Whilst walking up this path, Little Ingleborough and Ingleborough itself can be seen directly in front. The path home goes off directly to the right away from the stile, but a worthwhile ten-minute diversion to Gaping Gill can be taken by climbing over this double stile. Once over the stile follow the well-defined footpath heading in the direction of Little Ingleborough (straight ahead). After about two hundred yards the path forks, the left-hand branch takes you up Ingleborough and the right-hand fork crosses open moorland for another two hundred yards to the wire fence around the top of Gaping Gill. Each year in spring bank holiday week and at the August bank holiday, two potholing clubs run winches from the top of the hole lowering people to the bottom of the floodlit cavern, from where they are winched back out to above ground - there is a charge for this service. At Gaping Gill, Fell Beck disappears down a shaft descending from moor level to a floor of a large chamber 110 metres (350 feet) below. This is twice the drop of Niagara Falls. The chamber at the bottom is the largest in the United Kingdom. It is 150 metres by 100 feet long by 40 metres high. It is big enough to hold the Nave of York Minster. Bradford Pothole Club run the spring-bank winch, not as a commercial venture, but to generate funds for the club and to give financial support to the local cave and fell rescue teams. The winch is capable of taking safely twenty-five people per hour. Retrace your footsteps back the four hundred yards to the double stile. Once over the stile take the footpath that goes off diagonally right away from the wall along a grassy footpath. The footpath crosses open moorland and keeps generally parallel to the gorge, which is now on your right. The path climbs gently for about two hundred metres, but once over the brow descends keeping roughly in the same direction. As soon as the path goes over the brow of the hill, the very distinctive shape of Pen-y-ghent can be seen to the left, and from this spot excellent panoramic views can be had all around. On the descent, looking ahead slightly to the right on the opposite hillside can be seen the entrance to the walled lane (Long Lane) at the junction of two walls. Follow the grassy path down into the dip and then up diagonally to the right up a very well defined grass track to the junction of the walls. Go through the gate in the walls, then through another one ten yards further on. The lane descends steeply for about fifty yards before almost leveling to a gentle slope. This lane continues unobstructed apart from one gate for almost one and a half miles where at a T-junction turn right. 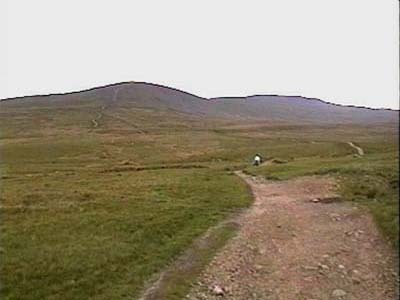 Along this stretch of lane, the path taken at the start of the journey can be seen off to the right, and Ingleborough Caves can be seen down below. At this T-junction, follow the sign "B/W Clapham ¼ mile" to the right and keep to the walled lane down the hill. Pass through two tunnels under the old railway line and a further one hundred yards on meets a road by the church. Turn left and follow the road for about two hundred yards back to the car park.